The Golden State Warriors didn’t need to force the return of the (almost certain to be) back-to-back league MVP, but that doesn’t mean the reigning champs didn’t need Stephen Curry. Just when it appeared as if the momentum in their Western Conference semifinals matchup against the Portland Trail Blazers was shifting in Portland’s favor, the Chef rose from the ashes (or came off the bench) and started cooking up something delicious. After a rocky start to Game 4 — he missed his first nine three-point attempts likely stemming from the fact that he hadn’t played since April 24 — Curry finally settled into the contest. And that was bad news for anyone not wearing a Golden State uniform. 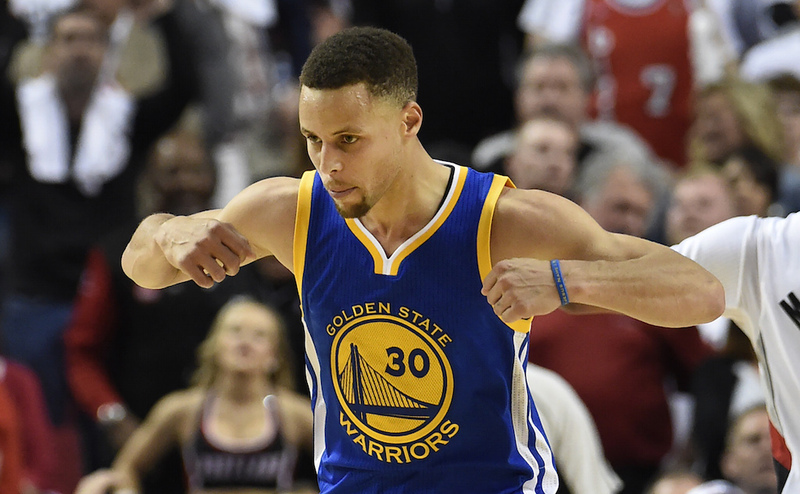 To say things clicked for the Baby-Faced Assassin would be a gross understatement. By the time the dust had settled on the Dubs’ 132-125 overtime victory, a win that gave the defending champs a commanding 3-1 series lead, Curry’s stat line — 40 points, nine rebounds, eight assists, and 50% FG — looked more like video game numbers. While this is something we’ve come to expect from the best shooter in the game, it’s still impressive. Of course, the truth is, Curry really came to life in the overtime period. And in doing so, he not only set the stage for the rest of the 2016 NBA Playoffs, but he made history in the process. Watching Curry drop 40 points in a single game is nothing new. In fact, given the way he drops buckets on a nightly basis, it’s become sort of mundane. However, when 17 of those points come in overtime, well, that’s when you can’t help but shake your head in disbelief. Because in NBA history, both in the regular season and the playoffs, it’s something that no one has ever done before. The beautiful thing about records is that while everyone know they’re made to be broken, that doesn’t make it any less momentous when it happens, especially if you’re fortunate enough to see it go down firsthand. There’s nothing quite like being a part of history; getting the opportunity to witness greatness. And that’s what Curry did. Welcome back, Steph. You missed the game. But trust us, not as much as the game — and the fans — missed you. Statistics courtesy of Basketball-Reference.com and ESPN.com. Chris Paul: The Greatest NBA Player to Never Make a Conference Final?